Faribault Foods sponsors this post and has paid me to write about its Mrs. Grimes Beans products. Faribault Foods provided samples of such products. The opinions expressed in this post are my own and based on my own experiences. 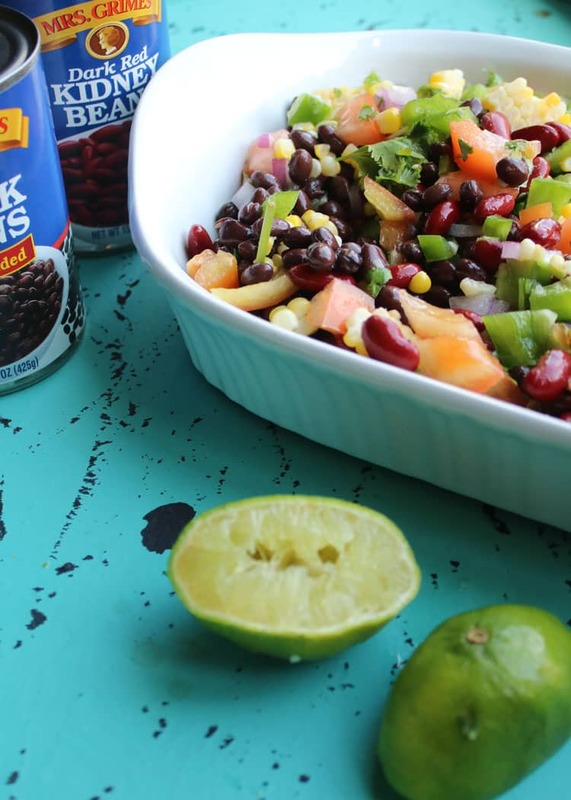 When you put ingredients like Dark Red Kidney Beans and Black Beans together with grilled corn fresh off the cob and a myriad of other tasty ingredients, you get a recipe that is as perfect scooped up on chips as it is in a spoon. Somewhere along the way, there came to be a big misconception that salads have to contain lettuce or other greens. 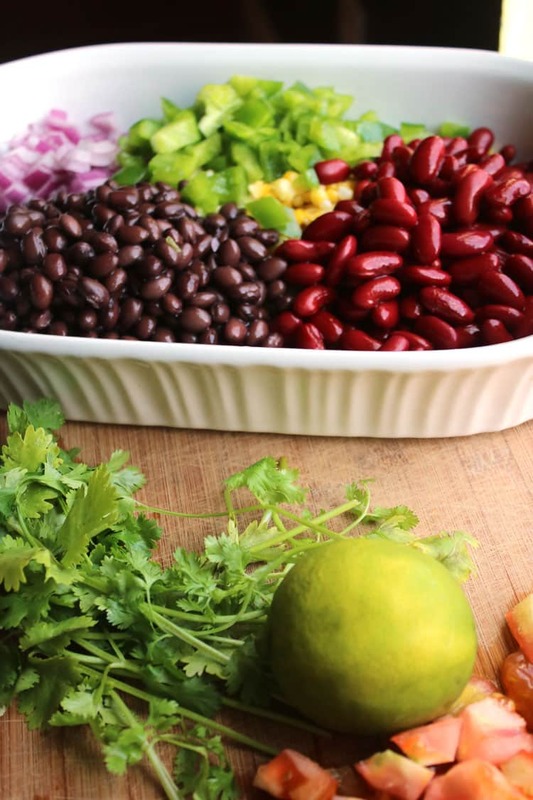 The combination of ingredients in corn and bean salad is amazing! The flavors of the fresh ingredients are blended to perfection. Cilantro, lime, salt, and pepper pull all the ingredients together and create a perfectly palatable side dish or appetizer that you can serve up for a family dinner or bring to a potluck. You won’t believe how easy this recipe is to toss together! 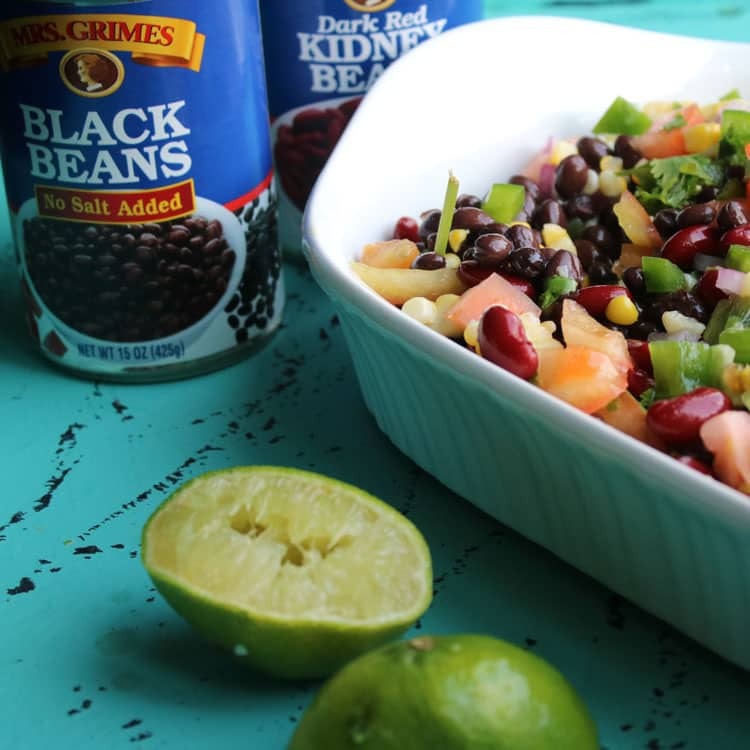 We love making salads with a variety of ingredients and love the flavor of Mrs. Grimes Beans! It’s easy to find Mrs. Grimes Beans at select Walmart Stores, HyVee, and Fareway stores. In addition, you can use this coupon to get $1.00 off two cans of any size Mrs. Grimes Beans. We think that’s a pretty sweet deal. 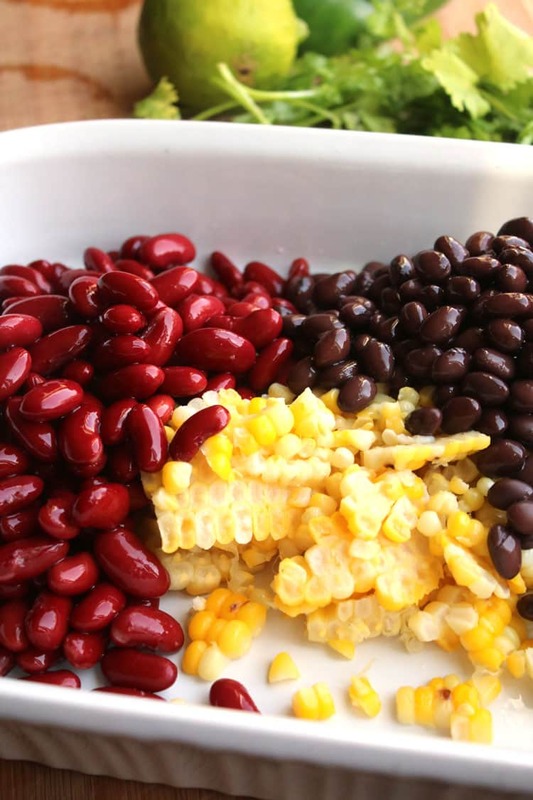 Add a few other ingredients to the fresh corn on the cob and rinsed canned beans to complete this easy recipe. 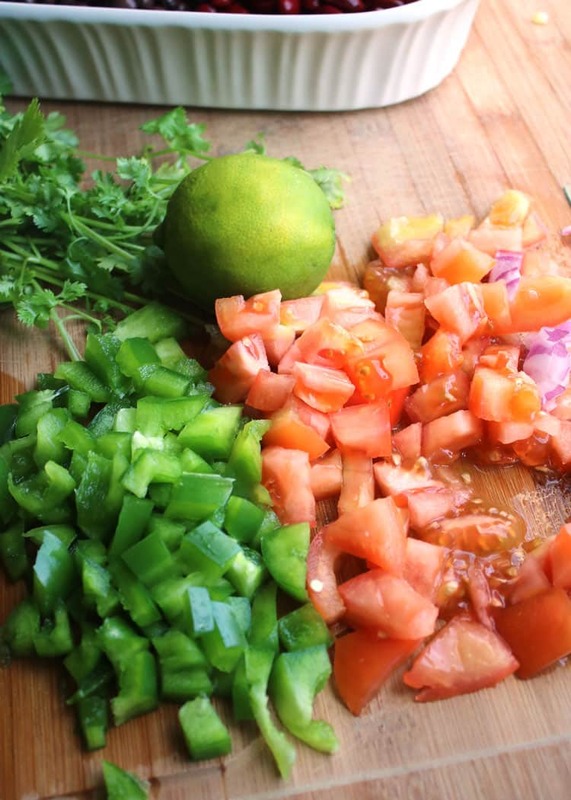 We chopped a tomato and half each of a red onion and green bell pepper. We also chopped a small handful of cilantro and halved a lime to squeeze over all the ingredients. 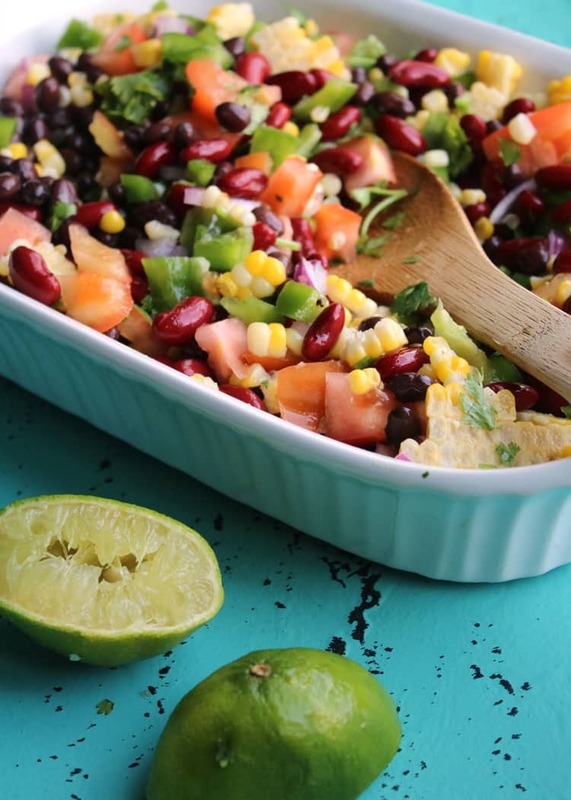 The lime helps to keep everything fresh, as well as adding a spectacular citrus flavor to the dish. We love whipping up salad recipes, as you can see by our Pesto Pasta Salad with Artichokes, Proscuitto and Mozzarella, and Orzo Pasta Salad, but we always love adding another salad to the menu rotation. If you’re planning to have a party or big barbecue, consider making a few fun and tasty salads to serve up to your guests. Not only are salads full of delighting flavor, but they also can offer healthy food options. 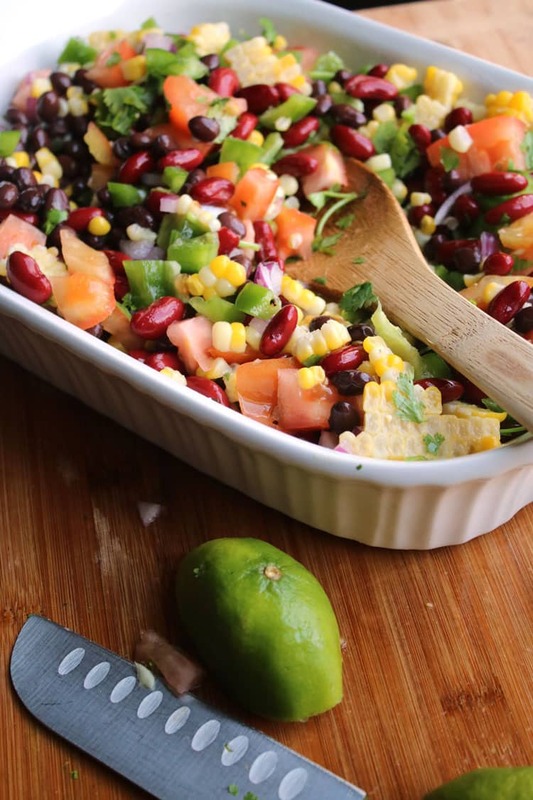 Our Cowboy Caviar corn and bean salad or dip is a great example of salad recipes that offer healthy ingredient choices. The combination of ingredients in this recipe is chalk full of good for you nutrients. 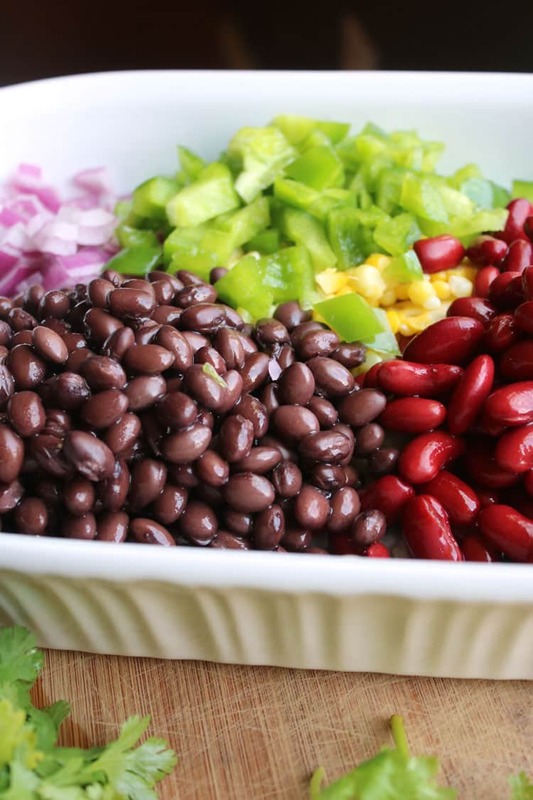 We’re talking about nutrition in the form of good fiber, protein and vitamin sources in every bite of these delicious beans, not to mention the health benefits in the additional ingredients. And you really can’t go wrong with a healthy recipe like that. Don’t Be Afraid to Adapt a Recipe! One of the things we love most about recipes like this is that you can make them to your liking. Of course, we are of the belief that you can adapt any recipe to be more what you want it to be. However, in this case, we’re talking about simply adding a little more of this or that ingredient to reach the optimal flavor level that makes you happy. Love corn? Add an extra ear. Can’t get enough tomatoes? Chop up an extra. Whether you serve this recipe up as a side dish, bring it as a dish to pass at a party, or enjoy a bowlful for a solo lunch or dinner, this recipe wins rave reviews from us. 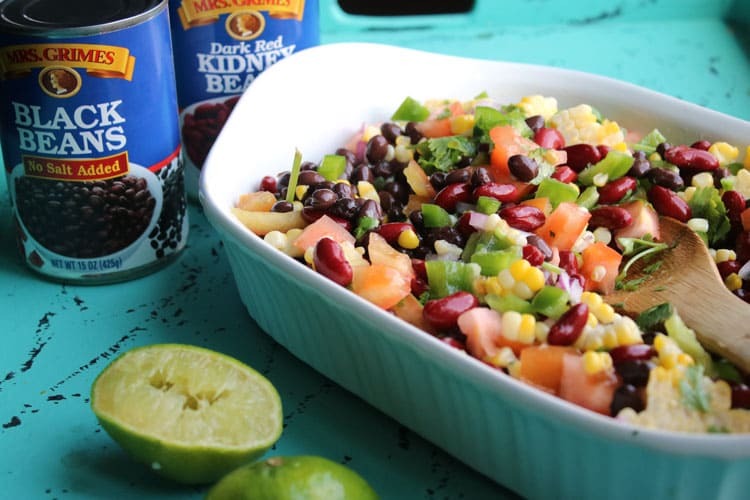 Having just finished a bowlful of scrumptious corn and bean salad, we can easily testify to the deliciousness that finds itself in every bite. And whether or not you serve this recipe up the same day, or make it a day ahead, the lime juice creates a layer of freshness that carries it through. 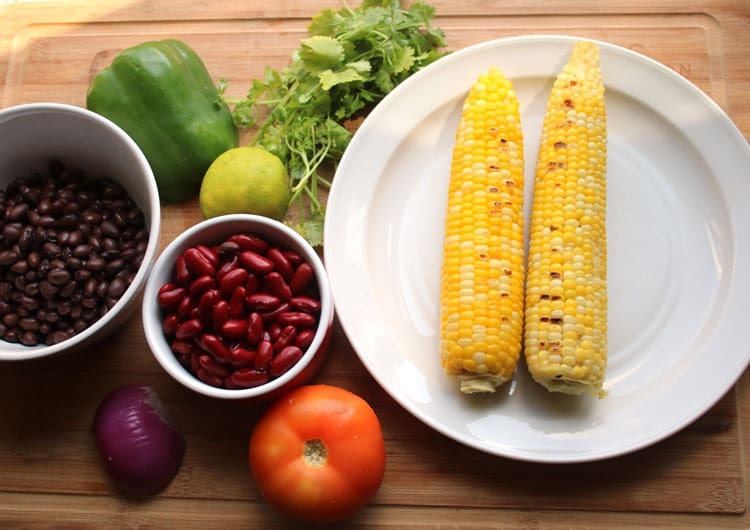 Cowboy Caviar will be gracing our table again and again. We love the ease in which it comes together. It doesn’t require step-by-step instructions telling you how to make it because you’re simply tossing fresh and canned ingredients together and serving cold. 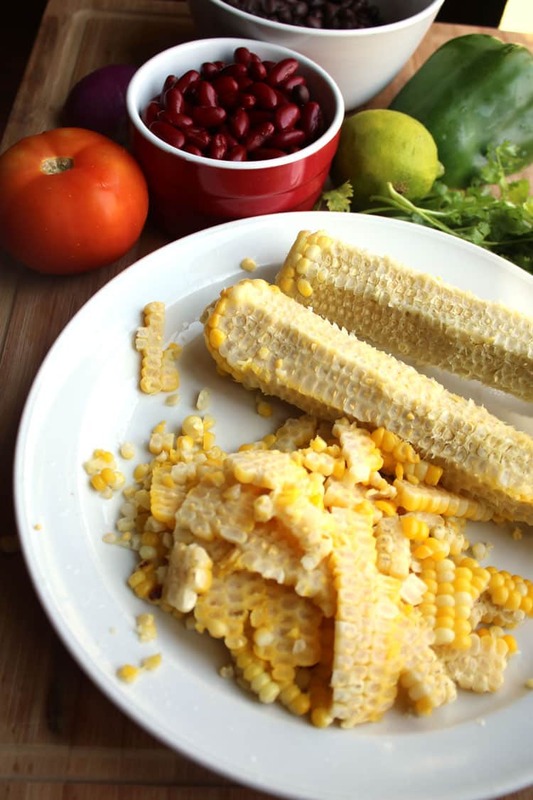 The only cooking that is involved is in the corn preparation step, but once completed, the most complicated step is all finished. Don’t be afraid to dish up a big helping of this delicious salad, or if you’re eating it with chips, don’t dip lightly. This dish is meant to be enjoyed and delighted in, and since it is full of good for you ingredients, keep that in mind when choosing which other items to balance out your plate. Personally, whether it’s a potluck or a holiday dinner, we’re always partial to side dishes. Don’t forget to save, print or pin this recipe so you can find it and use it again and again! Call it Corn and Bean Salad or Cowboy Caviar, this healthy and easy salad recipe is just right to serve as either a salad or as a dip to serve with chips. Either way, it is a delicious and easy side dish recipe to enjoy all year long. Cook corn by boiling for 5 minutes or until corn is fork tender. Toss on a hot grill for 1-2 minutes to flavor and add color. Drain and rinse both cans of beans. Dice tomato, chop onion, bell pepper and cilantro. Cut lime in half. Combine all ingredients, squeezing the juice of the lime over them and then stirring to mix everything. Top with salt and pepper, to taste.